Eyebrow tint is a form of semi-permanent hair-dye formulated specifically for use on the eyebrows. You can buy DIY eyebrow tinting kits from most pharmacies and supermarkets, or alternatively, you can choose a beauty professional to administer the treatment for you. Professional eyebrow tinting is available in most beauty salons and spas across the world. Why would I want to tint my eyebrows? For very dark haired people who dye their hair a much lighter colour, dark eyebrows can be a dead giveaway. In this situation, tinting the eyebrows one or two shades lighter is an easy and effective way to make the change look more natural. Also, blondes and redheads who wish to dye their hair dark may also consider tinting their eyebrows to match. However, you should remember that your eyebrows don’t necessarily have to match your hair colour precisely. You are generally advised to keep your eyebrows one or two shades lighter or darker than your hair colour. Greying hair is a natural part of getting older. When some people choose to let nature take its course, others prefer to conceal it. Although plucking the odd stray hair from the scalp is fine, plucking hairs from the relatively sparse eyebrow area is likely to produce unsightly bald patches and leave the brow looking misshapen. For this reason, you are advised to avoid the tweezers and opt instead for an eyebrow tint, which simply dyes the grey to match the surrounding hairs. Pale, translucent hairs can make the eyebrows look thin and straggly. Tinting these hairs could reveal a neat, shapely brow you never even knew was there. Even though the thickness and denseness of your eyebrow hair can of course not be changed in the tinting session alone, the darker colour will make them appear naturally thicker. It is very amazing what a difference a nice pair of shapely eyebrows can make to the structure of the face. Having neat, defined eyebrows frame the eyes, boosts facial symmetry and creates an attractive high-contrast look. It is a nightmare scenario – coming out of the salon with big, horrible unnatural looking brows. How do you make sure you avoid looking like your eyebrows have been drawn on? The trick is to choose a shade of that perfectly suits your skin tone and hair color. Black – recommended for use with black hair only. Taupe – a lighter brown shade with a hint of grey. Chestnut – a brown/red color great for redheads and brunettes who want their brows to look ‘browner’ than taupe (which is more of a grey/brown). Blonde – for people with fair hair or skin who want their eyebrows lightening. Grey – for people with white or grey hair who want their eyebrows darkening or lightening. After your patch test and consultation, your beauty professional will rub the area around your eyebrows with petroleum jelly to prevent the dye from staining the skin. He or she will then comb the tint from the inside corners of the eyebrows to the out, using a disposable applicator. The tint will then need about 5-10 minutes to develop, after which it will be removed using a cotton wipe. The tint is likely to stain the skin between the brow hairs initially, making them appear darker in the first day or so than they really are. Don’t panic if your brows look strange to you at first – the difference is bound to feel a little odd initially but you’ll soon get used to it. Improving our eyebrow appearance is simply a smart grooming strategy, especially when we’re going for a natural, off-duty look. After all, full, defined brows mean you can get away with less makeup and still look put-together. That’s why brow-tinting, a professional option that will beautify this facial feature sans makeup, is especially intriguing. When you compare the tinted eyebrows with their appearance before it was tinted, there is a very being difference. There is much beauty in tinted eyebrows than those that are not tinted. Unlike shaping waxing, threading, or tweezing, brow-tinting is a color service that doesn’t take away any hair but uses semi-permanent vegetable dye to enhance color, shape, and thickness or all of the above. The benefits are immediate. Tinting instantly makes you look groomed and adds more structure. Clearly, the color boost is the most obvious payoff of brow-tinting especially if you have fair arches. Tinting is ideal if you were born with pale, fine Renaissance brows because you get a stronger look definition and edge to your look. A darker brow tint can also provide an extra definition for light eyes, but those with darker eyes, skin, and brows can benefit from a little color boost, too. While you have a range of shade options for your brows, dark brown is generally the most popular. Most people benefit from going a bit darker or richer than their natural color. Keep in mind that the difference between a natural and strong brow isn’t that much. If you go too dark, your brows may look fake and inky. beyond adding color, eyebrows tinting boosts volume an awe-inspiring moment for anyone with naturally fine brows or simply over-plucked ones the color makes each hair more substantial. The dye tends to coat the hair, so afterward the diameter of each hair is bigger. It’s almost like putting a gloss on your head, it’s going to make your hair look thicker and healthier. Even if your brows are already dark, tinting may find hair that you didn’t realize you had. This is because some people’s growth tends to come in blonde, and tinting grabs those peach-fuzz hairs and fills in the shape. Those extra hairs not only widen your arches, but they can also lengthen your stubby tails. If your ends are too short, adding a tint can elongate them and make them more substantial. You can walk in with what looks like a half brow because of a fine blonde tail, and after a brow tint leave with a full brow. big hair-color change may throw off your brow color, making your arches appear too harsh or just off. If you go blonde or light brown, tinting your hair a little lighter can add balance so you look more natural. For example, you can take the edge off black brows by making them dark brown. Or, if your hair has warm undertones, adding a bit of warmth will help it match better, especially if you have fair skin. And of course, if you go dark you make want your brows to pack a darker punch as well. just as coloring your hair, brow-tinting can feel a little high-maintenance. Luckily, you don’t have to worry about roots unless you lighten the color. Brow tints are similar to a glaze on your hair. The tint slowly begins to fade after two weeks and will be totally gone after week four. If that sounds like a big commitment or investment for the long haul, you might want to just try it out for special occasions or to help transition through an awkward grow-out phase. Once you determine that brow-tinting is for you, there is one sure-fire way to make your tint last as long as possible. Don’t wash your face or touch your brows for the rest of the day or at least a few hours after you get them tinted. Washing them any sooner will prevent the color from fully soaking into the brow hairs. eyebrows tinting can make a huge difference for your arches, but it doesn’t solve every goal and it might even highlight flaws you want to hide. Tinting darkens your hair, but it can make any gaps or scar tissue more obvious, so you have to fill those holes with pencil or wax. Also, styling your brows necessitates a brow gel to hold the hair in place. and you should be picky about the pro, this isn’t just another DIY tutorial to master via YouTube. Go to someone with extensive training and experience. Both hair colorists and brow technicians are qualified,” says Sheikh. The main difference is that a colorist might use a hair dye. The brow experts we interviewed all use vegetable formula, which contain lower levels of peroxide than traditional hair dye. Finally, do your homework. Personal recommendations are always the best way to go. Get a referral or read reviews before booking an appointment and if the salon or technician seems shady when you arrive, hightail your brows out of there. Eyebrow tinting is described as semi-permanent dye not because the color fades, but because eyebrow hairs have a very short growth cycle. Eyebrow hairs tend to fall out within 6-8 weeks, taking the tint with them. If your eyes are the windows to your soul, they deserve some pretty fantastic framing, don’t you think? But grooming your eyebrows is by no means simple as you can just use your toothbrush. Nearly everyone has fallen victim to over-plucking, uneven waxes, and too-heavy filler. Getting a pro to shape them is the easiest way to finally get the brows you’ve always wanted. There are many women with all sorts of brow insecurities but brow specialist fills them whether plucked and even tinted each eyebrow for a full-on makeover. Eyebrows tinting proved that a perfectly polished set of brows can really change your look. Eyebrow tinting is something that is done at a salon by a specialist. Eyebrow tinting is pretty much dying your eyebrow to match your hair color. You should never try this at home because the time to keep on tint is much short and dye has to be placed just right or you will have dye makes above and below your eyebrows. If you’re a girl with barely-there brows, eyebrow tinting can help frame your eyes beautifully. This semi-permanent cosmetic procedure is a very attractive option if you’re tired of using an eye pencil or have noticed a few greys popping up in your brow line. Eyebrow tinting works well most women, and it’s perfect if you’re looking for a way to streamline your beauty routine. Once you’ve located a salon that offers this semi-permanent hair darkening service, the procedure is similar no matter where you go. The aesthetician will protect your eyes with an eye patch or mask and apply petroleum jelly or another lubricant to the skin around the brows to help protect them. Then, she will use a cotton applicator dipped in dye to apply the color solution to the eyebrows, eyelashes or both. After the solution dries, the aesthetician will wash away excess dye with soap and water. 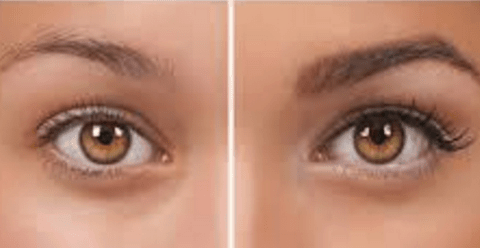 Eyebrow tinting is big right now, and even though the cost of having it done professionally is relatively low, it still requires a time commitment and regular appointments. 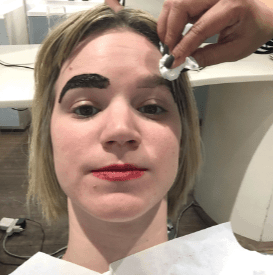 If you dye your hair a shade different than your natural hue, you naturally have really light brows, or you just want to have the boldest brows possible, then you may have already discovered eyebrow tinting. And if that’s the case, then you’ve probably discovered what a pain it is to have to keep them up. Eyebrow tinting starts to fade anywhere from 4 to 6 weeks which is basically having to get in to get them done once a month. Is Eyebrow Tinting Worth It? Using a disposable applicator to prevent the spread of infection between clients. While you can certainly opt for a professional eyebrows tinting treatment at a salon, you can also create the look at home on your own. The products involved may range from Clio tinted tattoo, kill brow and eyebrow shaping kit, which contains a felt pen that temporarily tints brows from five to seven days. There is also wunder2 wunderbrow, which combines hair-like fibers with a pigment gel that fastens onto skin and hair for a few days. The tint lasts a couple of weeks and makes it much easier to fill in your brows and on makeup-free days, your brows will still look refined. Barrier cream- this can be Vaseline or desert essence teat tree oil skin ointment. 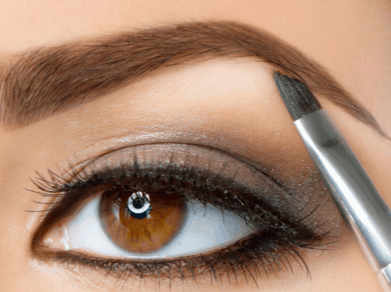 Do you want to know how to make natural eyebrow dye at home? White and grey hair is a huge problem for men and women. Nowadays it’s not even necessary that white hair will appear according to your age. Now white hair appears in young age as well. So, learn how to make natural eyebrows dye at home. Blonde hair has less problem with that instead of people with brown and black hair. Black and brown hair shows more white and grey hair that looks really annoying. 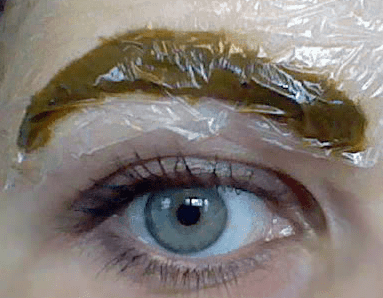 In blond hair eyebrows and hair look too light and if you like the darker tone without harsh chemicals or expensive hair dyes you must try this homemade hair dye for eyebrows and hair. White hair gives you sober & old look and its human nature to look beautiful and younger all time. There are so many hair dyes available in market lots of brands are giving amazing results but with all that, they so take a lot of money from you plus you cannot use those hair dyes on your eyebrows. So I decided to share simple hair dye which is not harmful at all, it’s completely natural and all homemade things are almost from kitchen cabinet so it would be great if the readers will give feedback about what I shared. Smoking can be the reason of grey hair so try quit smoking to avoid grey hair. Unhealthy lifestyle is also one of the reasons for white hair try taking a balanced diet that includes omega fats, vegetables, fruits, and fish. Caffeinated grounded coffee OR Instant Espresso 1 tbsp. Milk 1 tbsp. (more if needed). Place 1 tbsp. of grounded coffee in a medium bowl. Stir it until you get a fine mixture. Add 1 tsp. of cocoa powder in the mixture. Check the consistency and then add one more tsp. of hone and ½ tsp. of cocoa powder. Stir it until it’s mixed completely into a smooth mixture. Wash your face with mild soap or face wash it would be great if you wash it with gram flour. Pat dry face with soft towel or tissue. Now apply Vaseline on the skin around the eyebrows which you don’t want to be stained. Leave the hair area to dye. Place the coffee mixture on your eyebrows carefully. You can use mascara brush, spoolie, wooden stick or Q-tip. Apply completely on your brows. Leave it until you get the desired color. Clean your brows with wet tissue napkin or wipe. Do not wash your face with a face wash for at least one hour. Otherwise, coffee shade will give your face more tanned shade.